Choose one of the most versatile LED lights ever created for home, work, or outdoor use! No matter where you might be in the world, a good, strong light is important to keeping you on task, having fun or working hard when the lights go down. That's why you need one of the most unique lamps every created-the LED Luxe Lamp. Created with multiple light modes, bendable adjustability, and a 40-hour rechargeable battery life, the Luxe Lamp combines the best touch light technology with the versatility of indoor and outdoor lighting you can hold in one hand. A modern design made of highly-refined materials, choose from 18 different color and brightness settings including warm white, cool white and neutral white. It safely adjusts a full 360 degrees to make it useful while reading in bed at night, working under the car in the garage, or even providing a study lamp when finals keep you up at all hours of the night studying. And with four popular colors, Space Gray, Silver, Gold and Rose Gold, you can even get it to match your phone or laptop! Whether you get one for yourself or give one as a gift, the Luxe LED Lamp gives you the flexibility and mobility to light up the dark with crystal clear vision without a cord and without having to strain yours eyes. · Fully adjustable lamp for reading, needlework, studying, or during blackout. Add light to a bedroom, office or even in the garage with a versatile Luxe Rechargeable Touch Lamp; get yours today by clicking 'Add to Cart' above. ENHANCED LIGHTING CONTROL: The energy efficient Luxe LED Lamp offers three lighting modes and six levels of brightness, all controlled by a touch panel at the base. That's 18 unique settings to get the perfect soft or bright lights. RECHARGEABLE, FULLY ADJUSTABLE: This uniquely portable light charges via a micro USB cable and offers up to 40 hours of continuous run time. It can also rotate, twist and bend up to 360 degrees for maximum light exposure. Please note that just the charger that came in box can be used for the Lamp. ELEGANT, MODERN DESIGN: Every our table lamp comes in four distinct two-tone color variations to match your home décor. Use it on a nightstand, dresser, in the garage, on a work bench, on your work desk, or even camping. 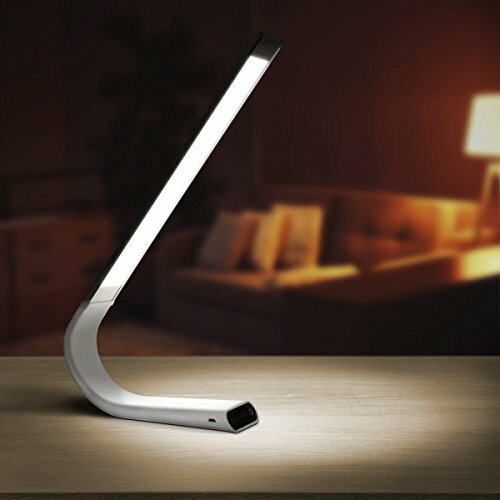 REDUCES EYE STRAIN: Luxe lamps feature natural LED lighting free of glare, produce little heat, don't emit UV, are free of eye-damaging blue light, and are fully adjustable; all to help reduce eye strain while reading, working or studying. EXTREME QUALITY AND DURABILITY - the case of the lamp made of high-grade aluminium, the bar made of soft rubber-like material and is water resistant. The LED panel will last over 50,000 hrs (no splash screen, not dazzling). Comes with 28 LEDs and a built-in 2000 mAh high quality Li-Polymer battery, which supports up to 3 - 40 hours runtime in 3 hrs continuous charging (charging cable included). And 1 meter fall protection ensures the lamp can sustain small drops and bumps. View More In Desk Lamps. If you have any questions about this product by Luxe Lamp, contact us by completing and submitting the form below. If you are looking for a specif part number, please include it with your message.